Will an increase in health spending, at the expense of other forms of social expenditure adversely affect health? New ILC-UK analysis shows that social spending is positively associated with increase life expectancy and curtailing investment may undermine efforts to improve the nation’s health. After almost a decade of austerity, the NHS in England is expected to benefit from a long-awaited public spending boost. Although the source of this new-found funding remains mysterious, it is set to benefit the NHS in England to the tune of a 3.4% real spending increase on day-to-day operations. Despite this pledge falling short of the historical average, it remains significant relative to recent, limited spending increases, especially when considering the pressures exerted by an ageing population. Yet, as the saying goes, there is no such thing as a free lunch. The announcement of extra cash for the NHS was quickly followed by reports that the Chancellor has announced that there is “no money left” for other areas of public spending, that have also borne the brunt of austerity policies since the beginning of the decade. Such an effort to improve public health may prove short-sighted. Access to health services, is of course, hugely beneficial to many people, but it is not the only form of social spending that influences wellbeing. The World Health Organisation notes that many factors, including; socioeconomic status, gender, education, physical environment and social support networks can all influence personal health. Indeed, “medical experts are increasingly” concluding that improved social conditions can “result in better long-term health”. The impact of social deprivation on poor health outcomes is known in the UK, with poverty estimated to “cost the healthcare system in the UK £29 billion a year”. Food poverty, fuel poverty, unemployment and other social factors are known to result in poor health behaviours, creating a downwards cycle where poor health becomes just as entrenched as the poverty that traps people in the first place. This raises the concern that an increase in health spending, at the expense of other forms of social expenditure could have adverse ramifications for health. Since the late 1980s health spending has been gradually increasing as a proportion of total social spending. 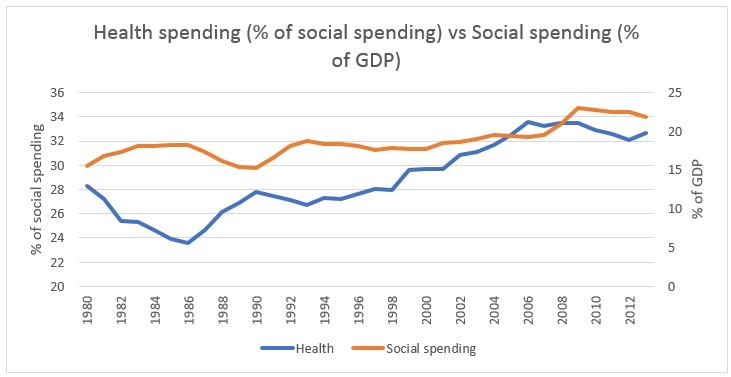 However, through much of the time health spending has been rising, social spending as a % of GDP remained relatively level, suggesting health expenditure has risen at the expense of other areas of social spending. To explore the relationship between social spending and health outcomes in more detail, we turn to some simple regression analysis. Using life expectancy as a proxy for health, and collecting data on GDP and social spending across 24 high income countries between 1990 and 2013, we examine at what this relationship looks like. The results are clear, that there is a positive relationship between different aspects of social spending and health, with life expectancy being used as our major health indicator. We find that when social spending increases by 1% of GDP, there is an associated increase in life expectancy of 0.106%. When health spending increases by 1% of GDP, the associated rise is 0.122% and when old age spending increases by 1% of total social spending, the associated rise in life expectancy is 0.023%. In all scenarios we control for GDP, year and country effects. The fact that social spending has a positive relationship with health is something that previous analysis has found. Increasing health spending is obviously important too, but dismissing other forms of expenditure, ignoring the powerful link social wellbeing has with health, is unlikely to address some of the systemic health issues the UK is likely to face as population ageing begins to gather pace. Good health contributes to a good economy. Ensuring that individuals have access to decent health care should be the aim of any government, but it is folly to not take any initiatives to prevent the worst excesses of poor health. While our analysis is relatively simple, it offers valuable insights into the role that government might have in promoting good health. It is vital we begin to recognise that the health of the nation is valuable in itself. An unhealthy ageing population will mean greater demand in the future for health services, not to mention the negative implications this will have for the labour force. The government has acknowledged the importance of increasing funding for the NHS. Now is the time to accept that health spending alone will not address the systemic social issues which also influence health.